Here is an odd little booklet, which comes with a particularly unusual provenance. 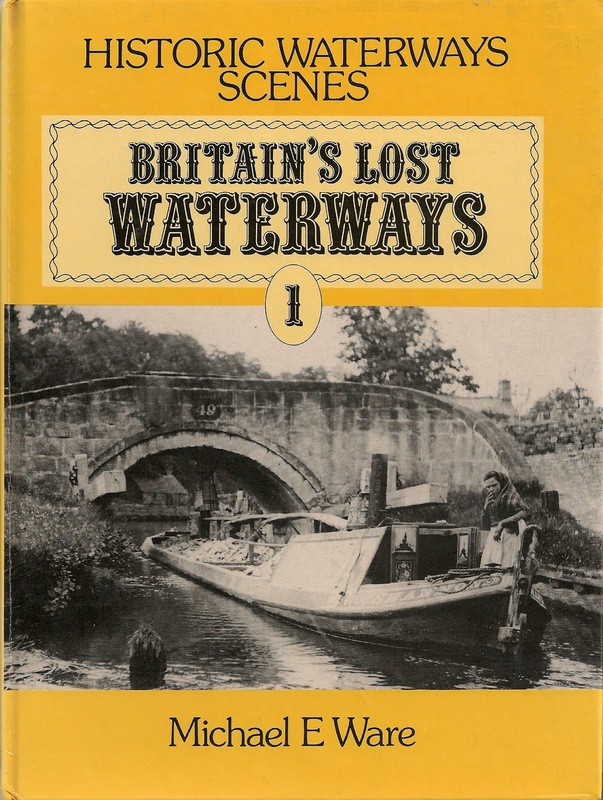 Its a book which was previously owned by my father, bought in 1980 and traces the history of the British Waterways Narrowboat carrying fleets. I have read a lot of accounts about the independent carriers like the GUCC, Fellows Morton & Clayton and Barlows to name but a few, but have read very little of the decline and decline of the BW owned fleet. BW inherited 1300 carrying and 500 maintenance craft on nationalisation in 1947, many of which were in a poor state of repair and lacked both crews and contracts. Then FMC failed in 1948 giving BW a further 172 boats. 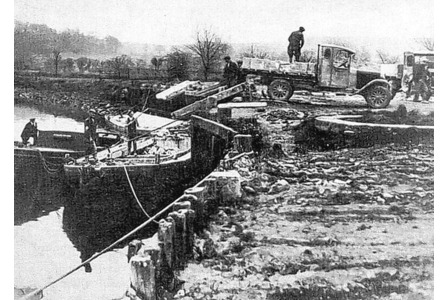 The booklet charts the sad decline of the canal carrying fleet, bedevilled by poorly maintained canals, boats past their operating lives and of course a fledgling motorway network which offered a much faster and more flexible bulk transport option. Decline was sad and remorseless, but BW didn't go down without a fight. They tried new craft with greater load carrying capacity and repaired the old craft to allow them to be more economic but in spite of their best endeavors they continued to lose money and eventually shut up shop in 1964. 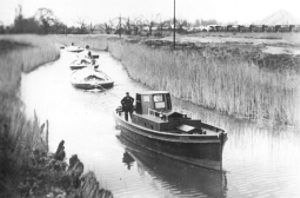 After this the carrying baton was passed on to Willow Wren and similar private concerns who leased a small number of boats and struggled against the tide to the end of the 1960's. Sure, BW scuttled a load of surplus boats, but no one wanted them. They innovated and introduced lightweight boats like the Admiral Class plus they maintained some of the older boats to the extent that they survived the barren years of the 1970's and were available for the restoration enthusiasts of today. The book contains a gazeteer of the BW fleet which includes great swathes of the Historic Fleet of today, boats like Aquarius, Atlas, Chertsey, Yeoford, Saltaire, Malus and many more. I posted recently about the introduction to a BW Cruising Guide to the Staffs and Worcester and this book takes the story on. Its a sad tale but whilst carrying has gone, many of the craft live on and enliven the network of today. This is the first of two picture books drawn from the archives of several major collections of canal images. The author trawled through a staggering 60,000 images over a two year period in the late 1970's and included 141 in this edition, each with its own detailed description of where and when it was taken, plus a well crafted context to give a wider view. Ware gives credit to Ronald Russell's The Lost Canals of England and Wales as his inspiration, and I can see how this volume represents a pictorial counterpoint to Russell's text heavy on the ground description of these abandoned waterways. This cross reference of authors is interesting as I only read Russell's book a couple of months ago. Given the volume of material reviewed its amazing that he managed to limit himself to just two books, this one featuring the inland navigations and promising the publication of a second on the routes linking into the sea. I can feel an Amazon search coming on. The world of waterways books is a fairly small one and it is striking that many of the finest photos of the inland waterways were taken by Henry Rodolph de Salis on his epic 11 year exploration of the system covering over 14,000 miles in the late 1800's, often aboard his 59ft steam launch Dragon Fly. Surely there is a biography of this man and his travels to supplement his exhaustive gazetteer of the canals as they existed at the time. 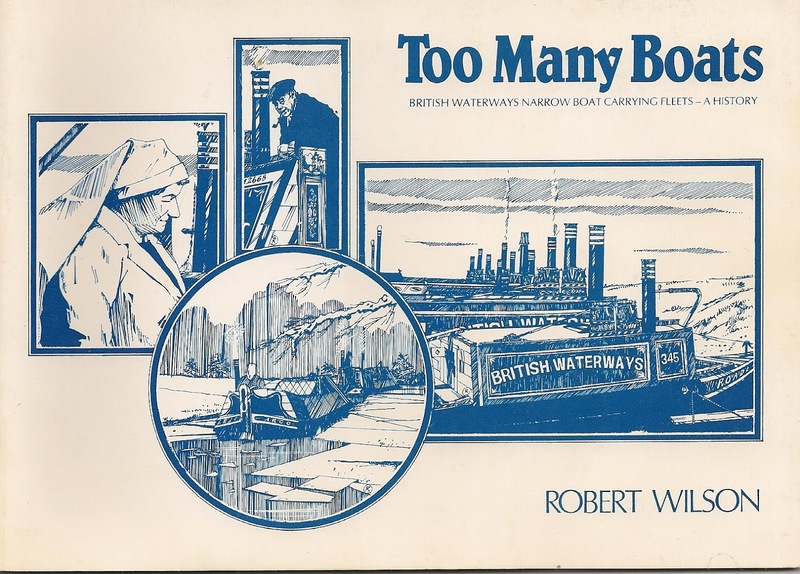 It is really difficult to pick individual images out of this book, which by and large follows individual waterways illustrated by groups of photos. 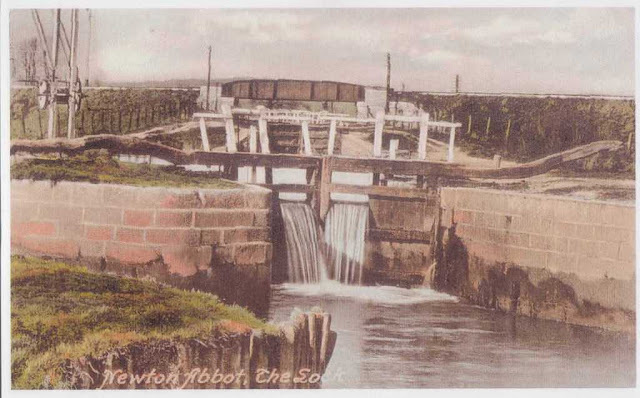 Here is an unusual image of the terminus basin of the privately owned Pensnett Canal, built in 1840 with this image taken in 1927 before its closure in the early 1940's. The line of the canal can still be traced from the western end of the Dudley Tunnel, but the basin is now buried beneath a trading estate. Here is another BCN scene, but this time one which should be familiar to all boating enthusiasts. 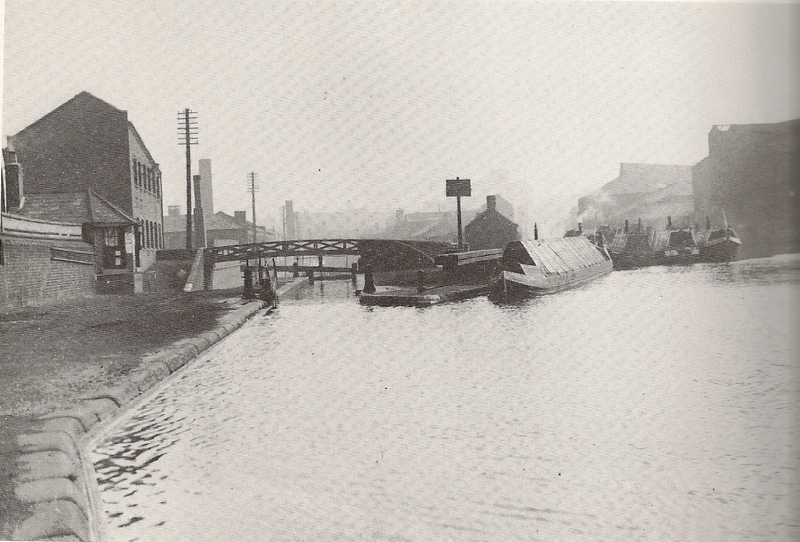 Its the top lock on the Farmers Bridge flight, but being taken in 1946 it includes the Newhall Canal off to the right. This canal was closed in 1948 and only its stub remains in the shape of Cambrian Wharf. The rest was buried beneath a series of high rise tower blocks in the 1960's and the foundations of Baskerville House. 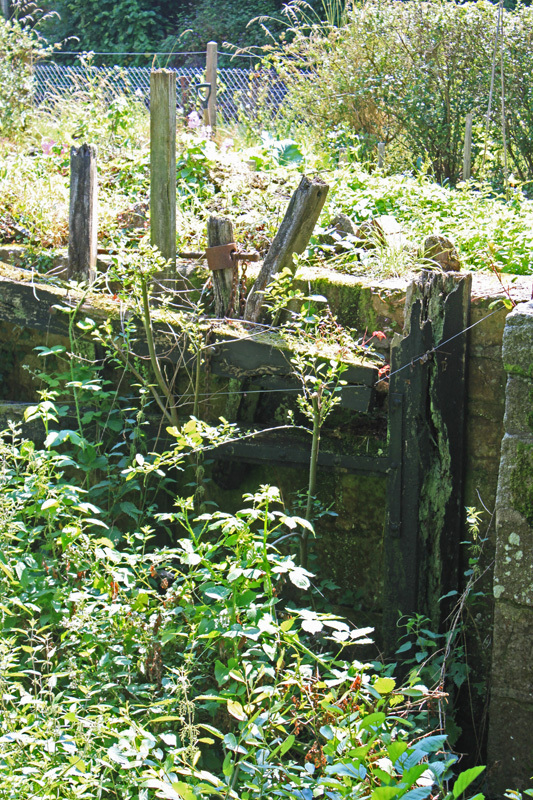 Sections of the old basin and its lock were unearthed during the construction of the new Birmingham Library. This is the third of Aaronovitch's "Rivers" books following the spooky education of Peter Grant, a PC specialising in the "strange stuff" which is hitting the Met left right and centre these days. I have to say that to my mind it is the weakest of the three, which probably accounts for the fact that it took me several weeks to complete, with several other books being read in the meantime - always a good indicator of the compellingness of a book. 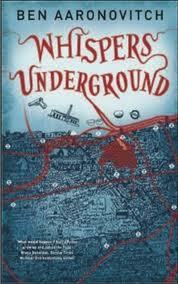 Grant is called in to investigate a suspicious death on an underground platform and a dash beneath the streets of London ensues. But its not as gripping a tale as we have been treated to in the last two books. The old characters are present, Nightingale his teacher and mentor plus some of the intriguing "river" girls, but they have been pulled back to the margins and the resulting line up us the less for it. Then there is the style of writing which has evolved, lots more slang, swearing and pop culture references which will make the book date like crazy. I don't see this change in style as a positive step, sloppy more like and all those references to Terry Pratchett and Dr Who dropping me right out of the fantasy the book tries to weave. So my conclusion is a rather modest "ok", not a bad tale but not great either. Maybe this once innovative concept has run its course and is incapable of maintaining sustained interest. This is not shaping up as another Discworld. I am advised by Janette Lauden that Pat Warner (Pat Hill), author of the evocative The Lock Keepers Daughter died last week surrounded by her family. 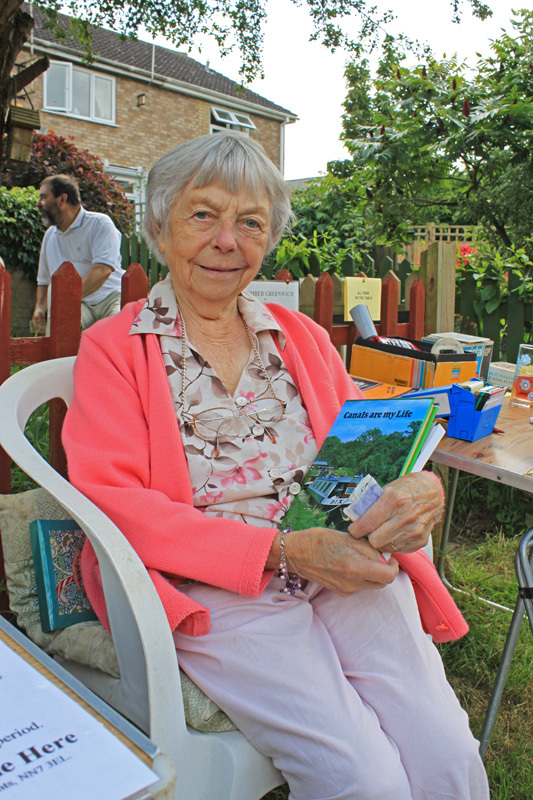 Pat's book offers a unique insight into life on the Tardebigge Flight in a different age. Like Rose Skinner, Pat was one of the last people to be able to provide a fist hand account of how things were and we are the richer for the book she leaves behind. Our thoughts and prayers are with her family at this time. Chris from nb Nebulae knows of my passion for obscure waterways books and takes an active role in feeding my appetite, coming up with some real gems from his extensive library. Every now and then I arrive at Wand'ring Bark and see a carefully sealed package in the bows, and I know I am in for a literary treat. 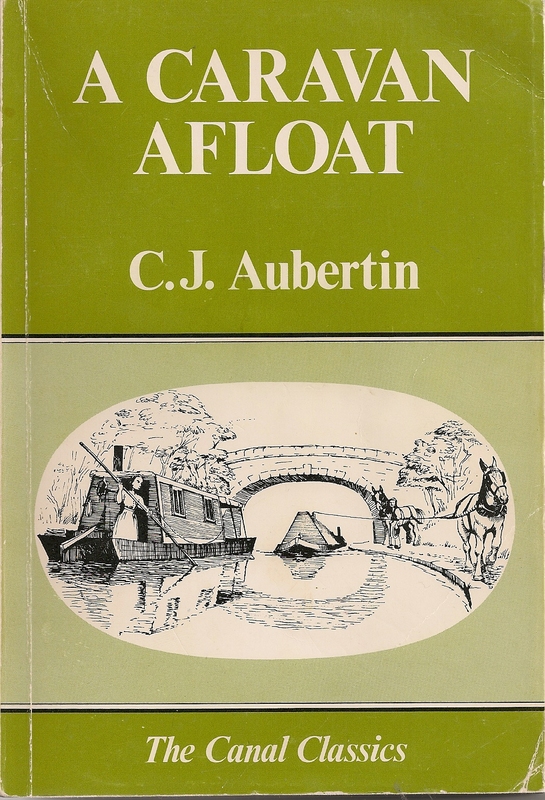 This week was no exception as I unpacked a copy of A Caravan Afloat by C J Aubertin, a 1982 Shepperton Swan reprint of a 1916 account of pleasure boating at the outset of the first world war. I have read many trip report type accounts of watery travels, but never one from dawn of the 20th century. It's an account which predates Rolt by a good 40 years, and records life on the canals a mere 50 years after the railways burst on the scene and the declining waterborne traffic was still propelled by natural horsepower. All in all a very unusual insight. The author owned a 2.5 ton punt like craft which, in the absence of a better title, was described as a floating caravan. Of course, like most other boats of the time, it was unpowered and trips involved the hire of a man and a horse. This presented a problem at the outset of the war when he needed to get the craft from Marple to Reading so, with typical British pragmatism, he and some friends took in on themselves to bow haul the boat themselves. 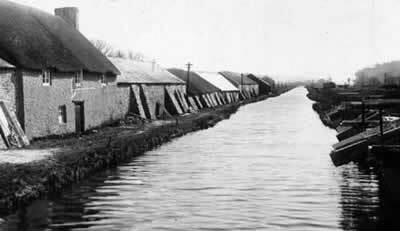 So we are treated to a very eloquent account of canal life during a period of huge change. 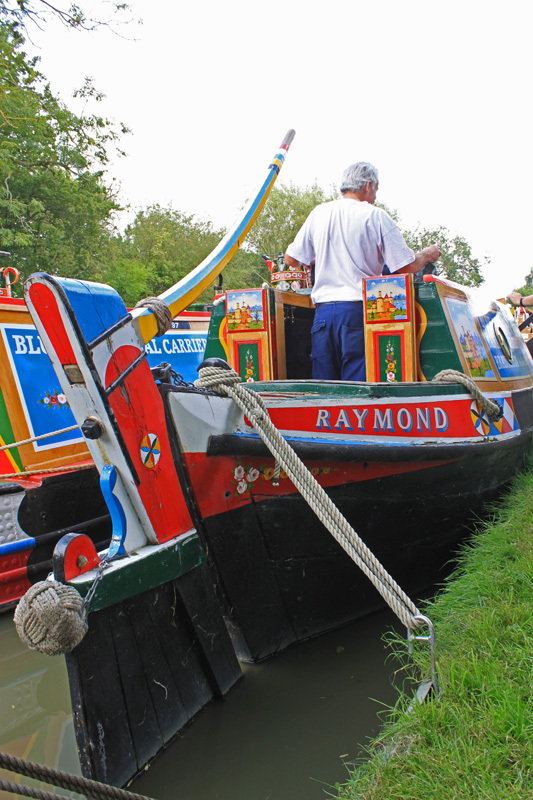 We follow the boxy boat along the Macclesfield, Trent & Mersey and Oxford and so out onto the Thames. 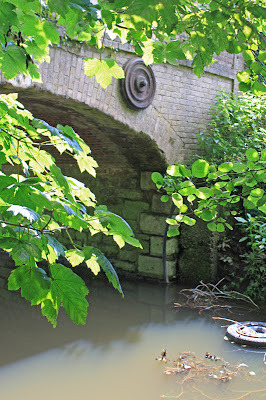 They record the rural idyll in Cheshire and Oxfordshire contrasted against the industrial chaos of the Potteries accessed via a subsiding Harecastle Tunnel where they had to wade along a submerged towpath, the orange water reaching up to their knees. Perhaps the greatest surprise of cruising in these days is the challenge of finding provisions. With no fridges getting fresh supplies was regular requirement and we find a landscape of occasional villages with shop opening hours highly restricted and a crew resorting to begging and borrowing what they can to put food on the table. 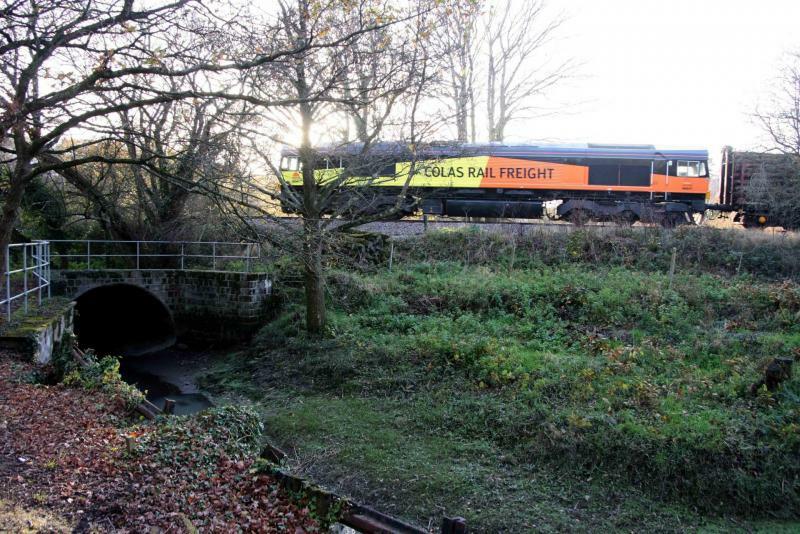 This was also an era of pre nationalisation with the canals in private or railway hands, forcing them to pay tolls as they progress and canals facing an uncertain future. With the core journey out of the way Aubertin devotes chapters to the boats, their crews, the impact of the railways and of course an inevitable look to the future. 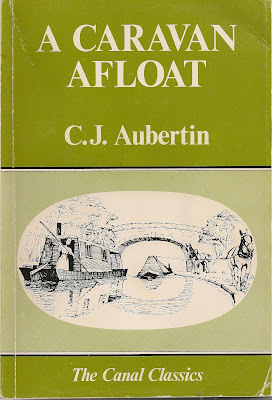 I think that in his heart Aubertin realised that the life on the canals had changed forever and the shift of goods to the railways was both remorseless and permanent, but he does look to the continental model of waterway improvement but this is more in hope then expectation. So here we have a very unusual book, providing a pleasure cruisers perspective when a boat of this type is a real novelty acquiring its nickname "The Ark" from the declining body of "real" boatmen. 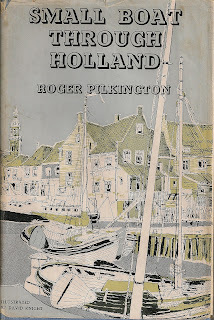 You may remember my recent review of Thames Waters, Roger Pilkington's first book about his travels on board Commodore, an ex wartime Commodores barge. Roger wrote a whole series of "Small Boat" books covering the travels of Commodore and her successor as he explored the waterways of Europe. 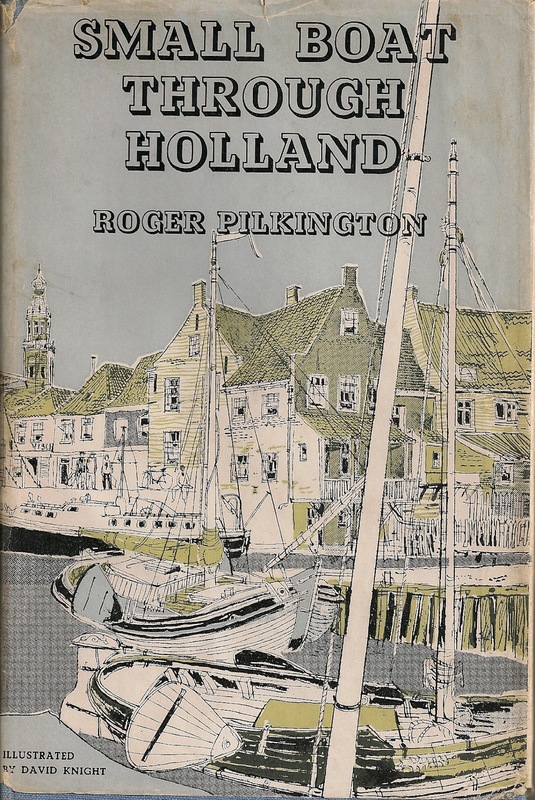 Ideally I would have liked to have read Small Boat through Belgium which is the next in the series, but such is its rarity that I cant find a copy for less than about £18, so I have skipped forward a couple of years to the late 1950's when Commodore spent a few seasons on the Dutch waterways. Belgium was explored with trips to and fro across the Channel but her arrival in Holland called for a different strategy and she was routinely hauled up out of the water and put in a shed for the winter. The thing I like about this series is the interest the author takes in his surroundings, looking at the history of the area and observing the customs of the local inhabitants. All this is recounted with a considerable degree of humour with the journey providing the thread which holds it all together. The Dutch canals around the Ijsselmeer have always interested me. I routinely fly in and out of Schiphol Airport and always peer down at the canals which fringe these huge polders, wondering which are navigable. 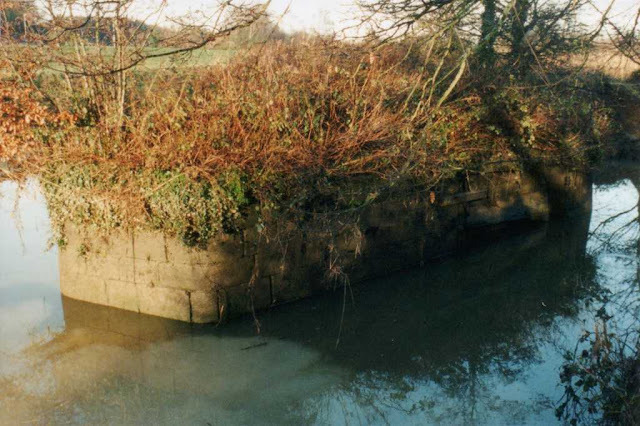 According to Pilkington there are hundreds of navigable waterways, with narrow channels leading up to most hamlets. Whilst the land is very flat, like the Fens, there is much of interest, particularly the old ports which now find themselves many miles inland and surrounded by seas of fields. We are given a potted history of Holland and its bloody oppression under the Spanish Inquisition, its inhabitants subjected to all kinds of horrors. But against this bloody backdrop the indomitable spirit of the Dutch comes to the fore, refusing to accept a subservient rule and standing out for freedom and justice. They paid a heavy price and repeatedly resorting to the flooding of their hard won polders to drown advancing armies like a latter day crossing of the Nile. Then there is the geography of the place. A land wrested from the sea and disaster never more than a storm away. At the time if the book the Ijsselmeer was a relatively new feature, a huge freshwater lake created out of the Zyder Zee by the construction of a huge dyke and large tracts drained and turned to agriculture increasing the size of the country by nearly 11%. 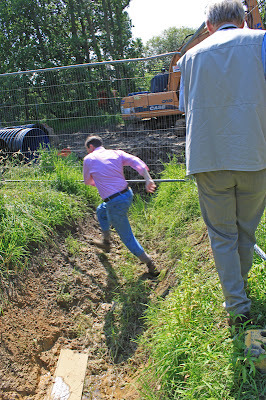 This drainage programme was so dynamic that Commodore was run hard aground in new dyke not shown on the map during a night time journey to visit an island which was about to lose its island status. It all adds up to a delightful image of a cruising area waiting to be explored. We leave Commodore heading to the Baltic and another of her watery adventures, not bad for a 46ft cutter with one small engine capable of no more than 7 knots. The book may have been printed 55 years ago but it retains a timeless charm and is completely compelling even today. Does anyone out there have a copy of Small Boat through Belgium I can borrow? Another weekend and another festival for Wildside Preserves. 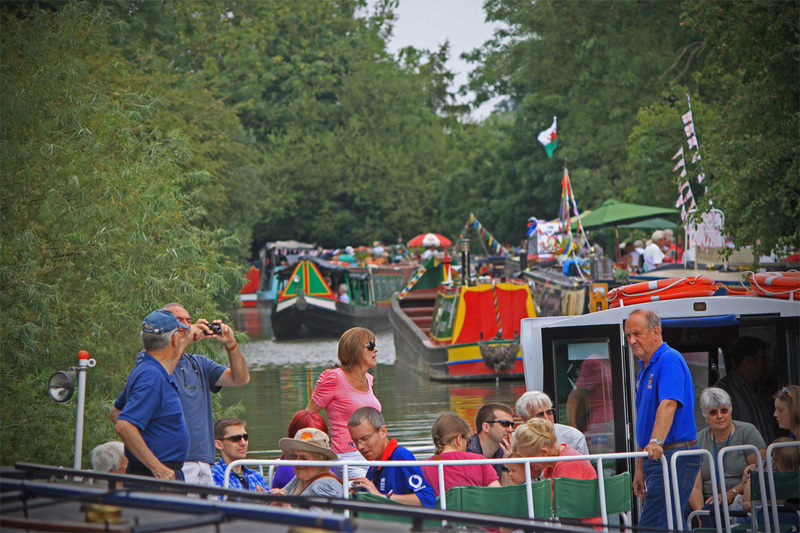 This time it was destination Blisworth on the Grand Union, a two day event which is now into its fouth year. 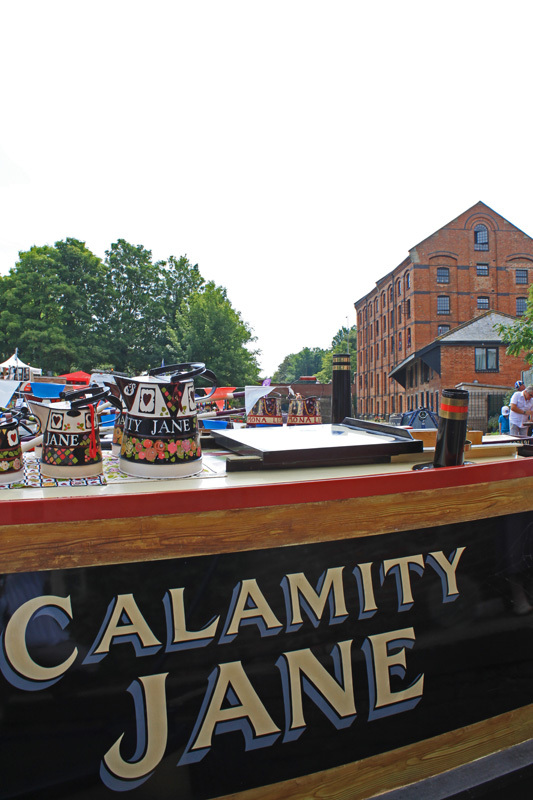 This isn't exactly a canal festival, more a village festival with a focus on its canal side. 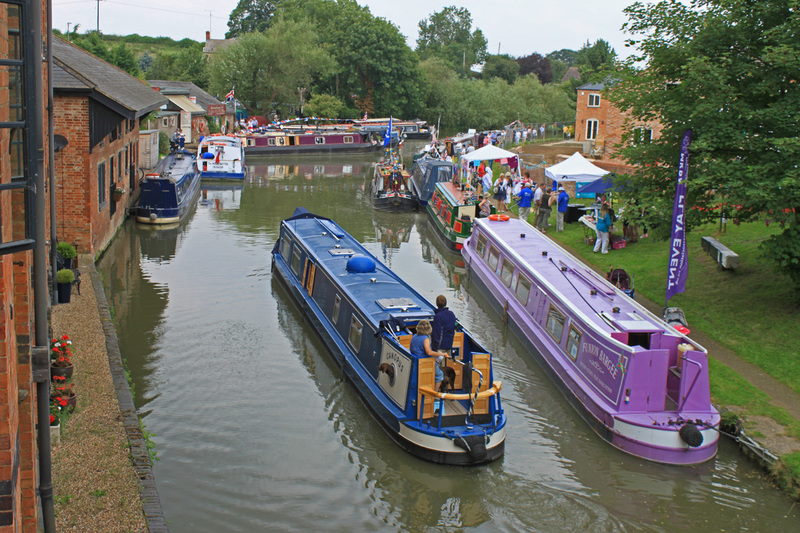 Blisworth is no ordinary village, it is a community with a huge civic pride which has led to it winning the best kept village on Northamptonshire only last week. 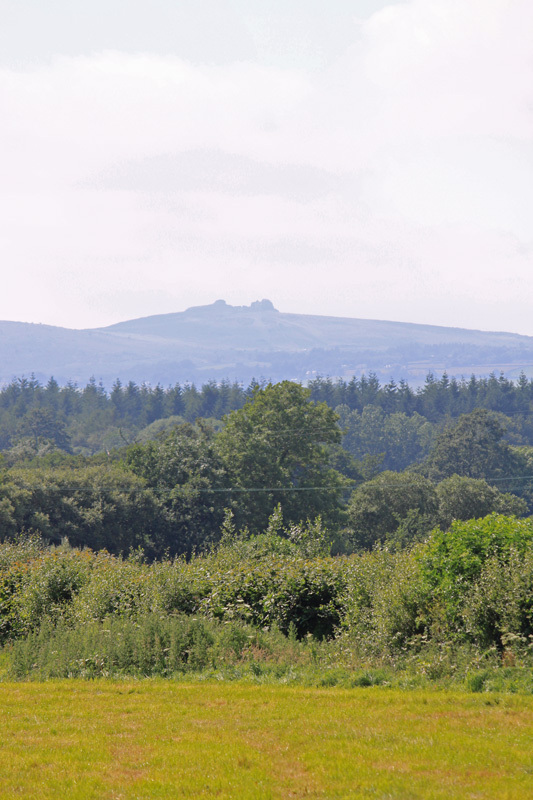 The locals are justifiably proud of their village and are keen to show it to approx 10,000 visitors who throng to their festival each August. Its a big event in the boating year too, an arguably one of the finest. As the event covers the entire village entry has to be free, as does parking. 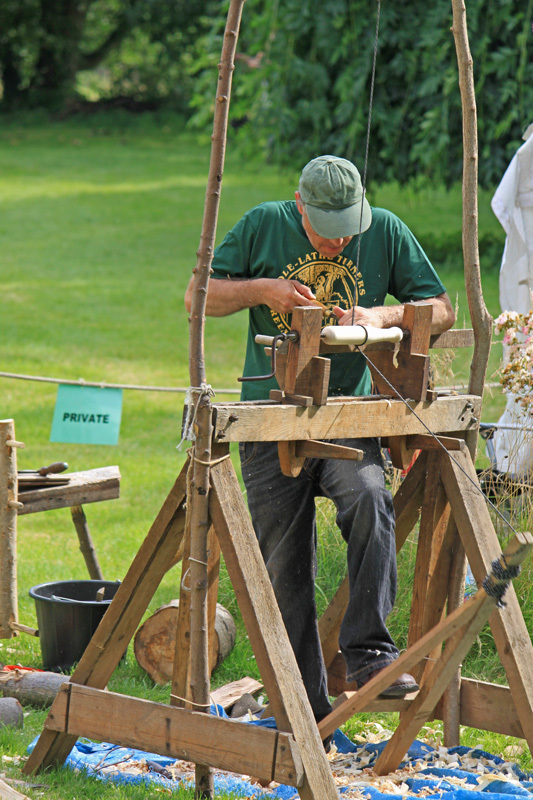 By the same token, charitable stalls gain free access and traders pay a modest £30 for a pitch, so there are plenty of things for all those visitors to look at during their time in Blisworth. So how was the festival for me? 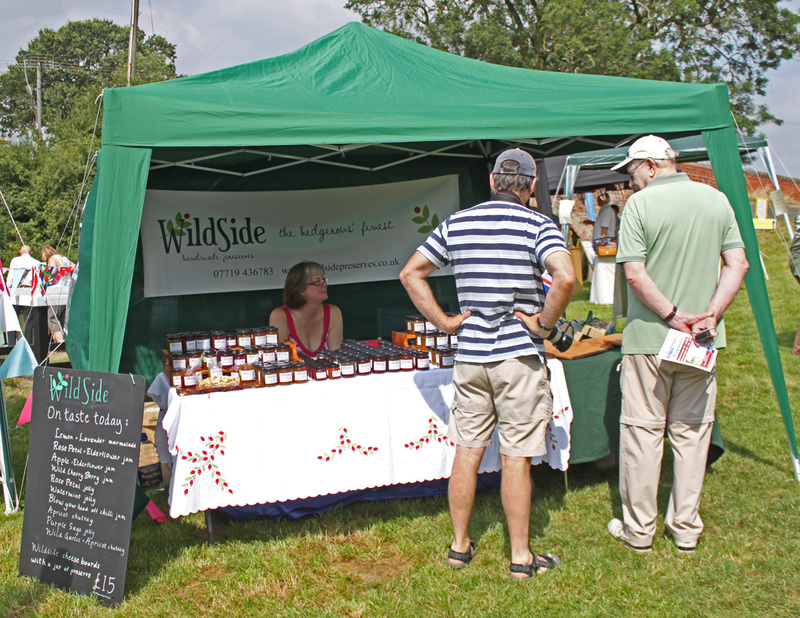 Well, from a Wildside Preserves perspective we had a record breaking event under a glorious summer sky, with visitors clamoring for Belle's preserves. Wow, have those people got a taste for chutneys. Maybe the Cheese Boat got them in the mood. But to measure the success of an event in terms of takings misses the point. The event was packed with a great crowd of traders and it was lovely to sped some time with friends old and new, especially the Allotments Society who occupied the stall next to us and who are a core part of the organising committee. All the recognised trading boats were there, Cheese, Cookies, Fudge to name but a few, serving their customers direct from their boat windows. Then there were the historic boats including Raymond, proudly displayed by her many friends. But perhaps the moment of the weekend for me was one of those unexpected meetings. I was making my way along a heaving towpath when I was met with a trumpet blast from a little elderly gentleman and there beside him sat a dignified little lady with a few old books and a model of a narrowboat called Bix. I stopped, paused, and turned back. Didn't I read of a boat called Bix and her adventures on the 1970's? Didn't it end with the author moving afloat to a house in Blisworth where she could watch the Grand Union from her kitchen window? Could this really be Iris Bryce? Indeed it was, and she shared some of her recollections from cruising back when I was a teenager. What was, more it turned out that I had read one of the few copies of her third book so I promptly bought a reprint of the first and her last copy of the second to complete my set. Watch out for a book review or two review here! 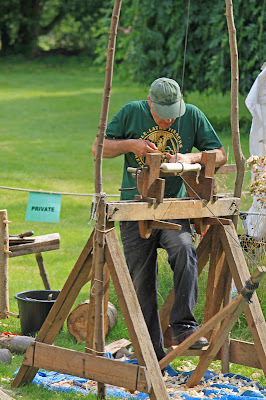 So all in all I was very taken by Blisworth Canalside Festival, and Blisworth as a village. 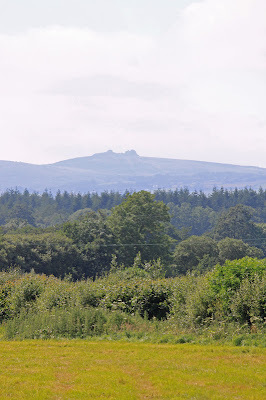 Its a lively place and certainly hosts a festival which is well worth a vist. 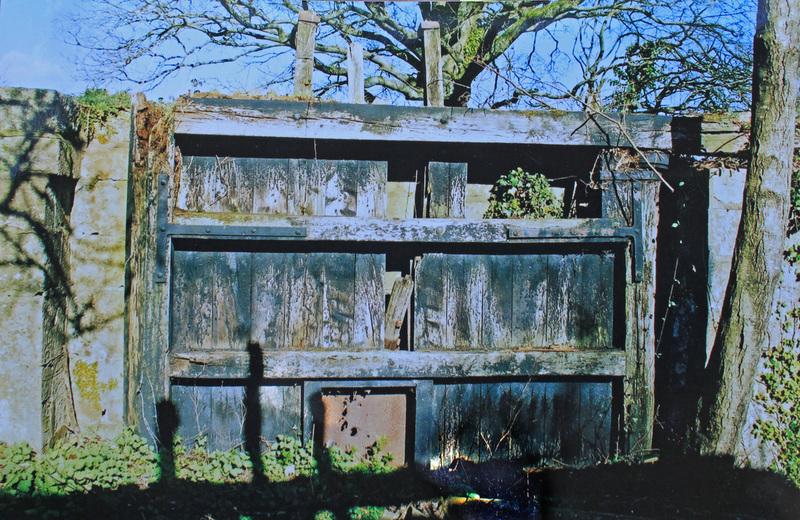 This represents journeys end for the Stover Canal, the place where the canal fell through a staircase pair of locks into the tidal White Lake Channel and then on into the river Teign and so to the sea port. 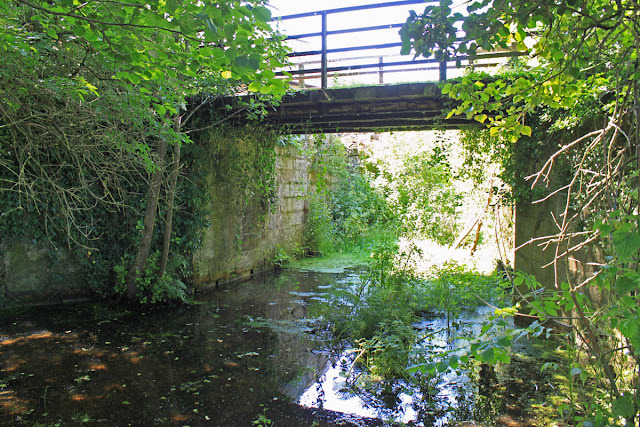 This area is hemmed in by the railway track and industrial redevelopment and to get a feel for what the sea lock looked like you really need to have a look at the old photos. Probably the best way to explore the remains is by canoe on a spring tide when the White Lake Channel offers a good way in. You can paddle right through the remains of the bottom lock and then through the tunnel under the railway which was built to a low height after navigation had ceased and stands on the site of the upper lock. I would dearly like to say that I explored by canoe but sadly canoes and weddings don't go together very well so I would refer you to this link where an intrepid group recorded their trip with a time lapse camera. Jetty Marsh Locks as they were - note those rustic balance beams! 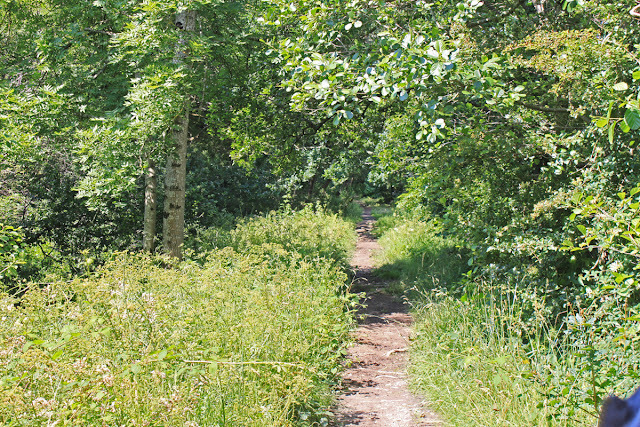 White Lake Channel, probably named after the white clay workings beside the canal, runs east for a mile or so before joining the main river. This has always been tidal and Jetty Marsh was therefore a staging point for boats waiting to catch the ebb tide and a free ride to the river mouth. I fear that my visit to the Stover was all too brief and superficial. All mistakes in this series are mine and down to my inattention during Paul's excellent tour - my excuse was my enthusiasm to get some photos! 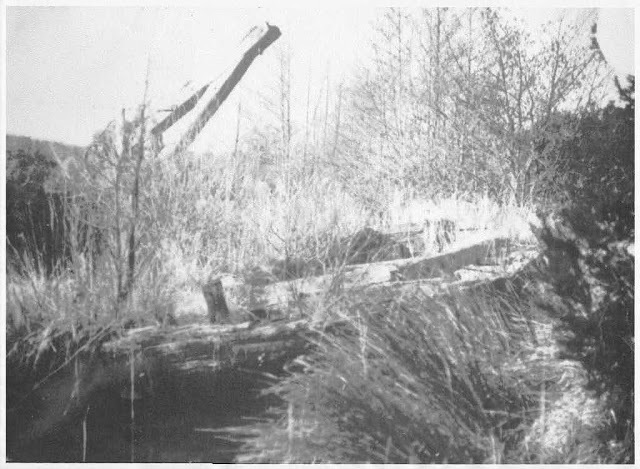 Due to time constraints I wasn't able to visit the Jetty Marsh site and this last post has therefore been compiled using photos available on the internet. I will rectify this omission on my next visit to Torquay. I like to leave a bit of every canal unexplored - a good reason to revisit. 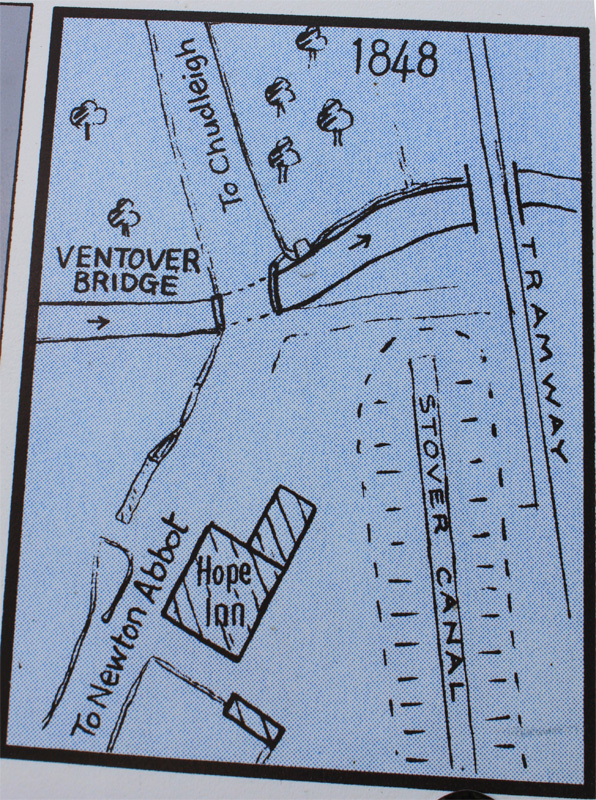 For a far more comprehensive record of the Stover, and the plans for its future, have a look at the website of the Stover Canal Society. 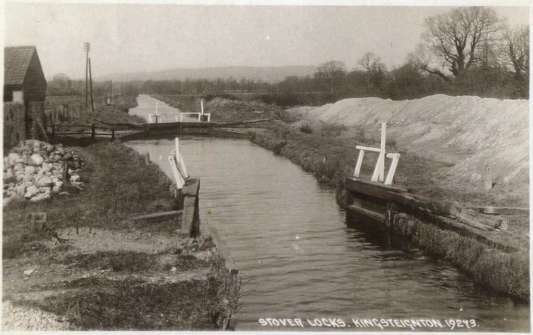 Teignbridge is the only road crossing on the Stover Canal, and perhaps it should be called Teignbridge Lock because this was the site of the middle lock. 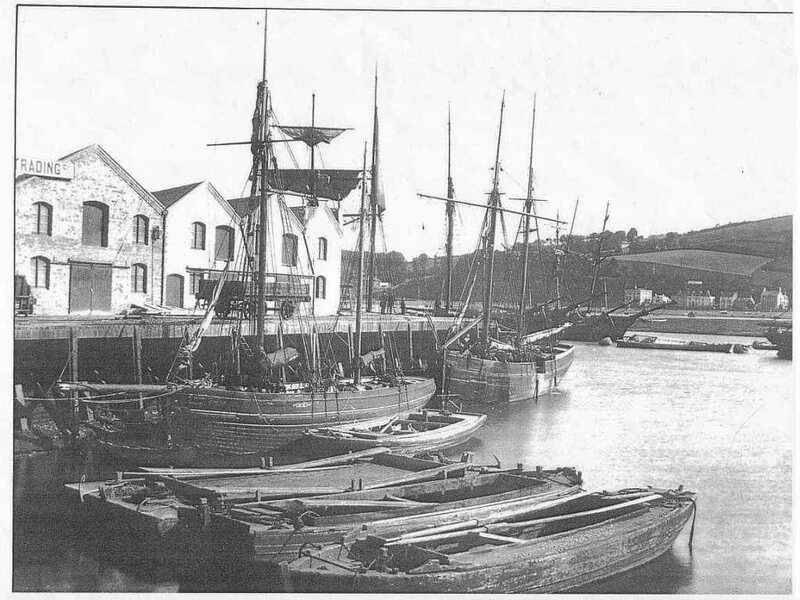 I say was, because it was turf sided and little more than a stop lock used to help boats under the low span of Teignbridge. 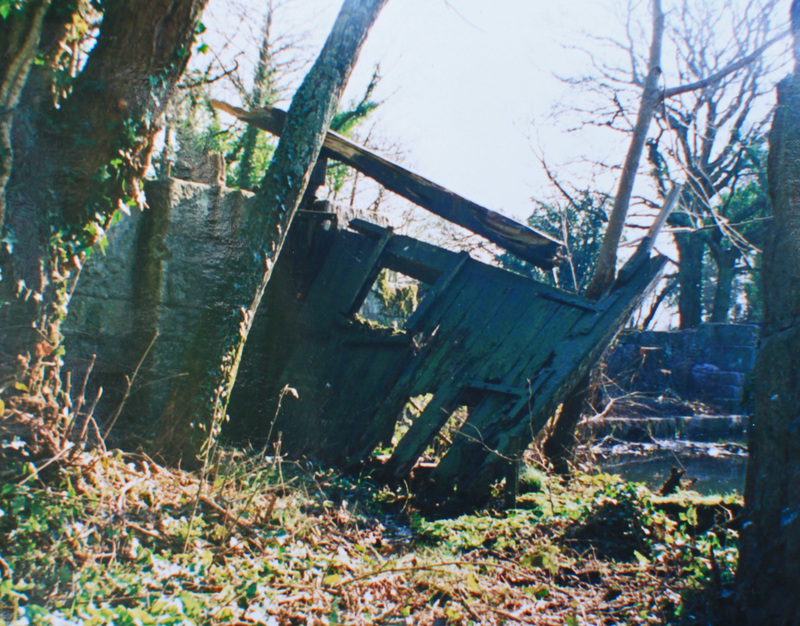 The site was cleared a few years ago and all that remains of the gate buttresses are some heaps of rubble in the undergrowth. 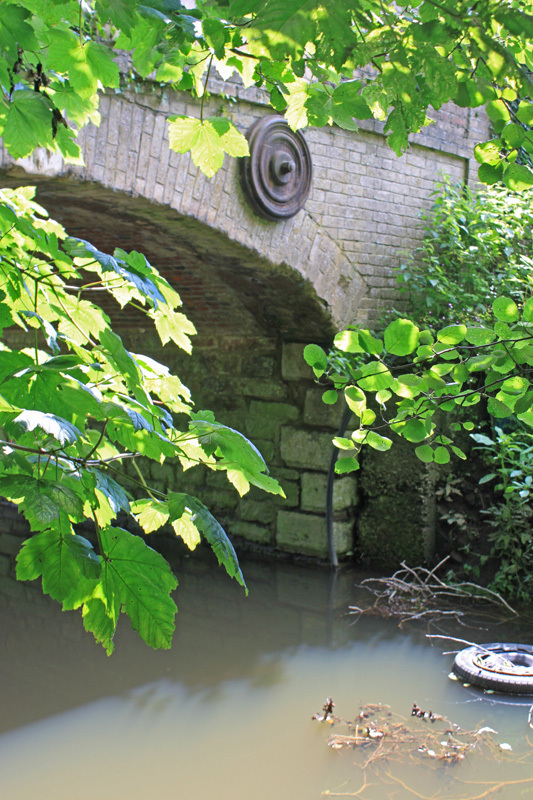 The bridge itself bears the scars of boats scraping their way under, scoring deep marks into the masonry. 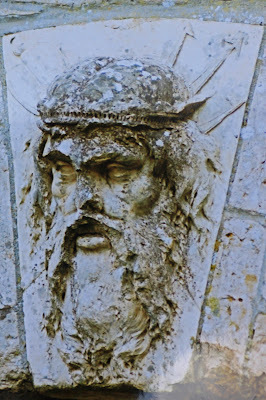 The bridge also holds another interesting twist - two keystones made of a reconstituted stone which outlasts the real stuff carrying rare images of Neptune and a ram. 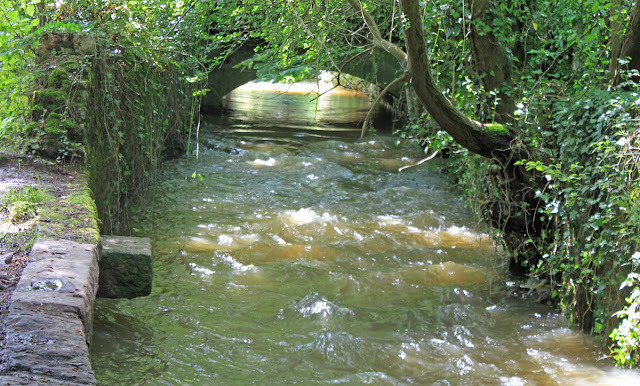 Downstream from the bridge is a long straight channel bordered by the old lock keepers house and the clay cellars. 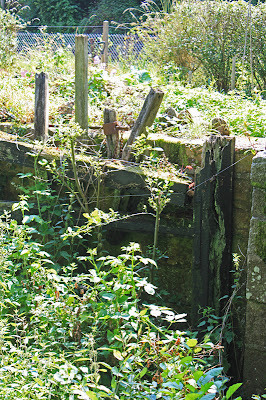 Today the base of the hose remains but the cellars are gone. However, this is the site of many iconic photos of the canal, taken when photography was in its infancy. 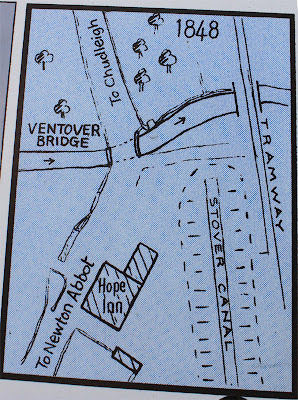 This last section is the scene of the latest developments for the Stover Canal Society, who have recently secured grant funding to reinstate the towpath as part of the Templer Way, and so encourage the people of Newton Abbot to visit the area and hopefully agitate to the restoration of this historic waterway. It sounds like a plan to me. It's my usual practice to buy a copy of Waterways World whenever I am near a chandlery / boatyard / WHS in Euston Station which effectively means every month. Well, I dropped into Napton Narrowboats a couple of days ago and resister the urge to look for the September Edition and sure enough, a complimentary copy was waiting for me on my doormat. 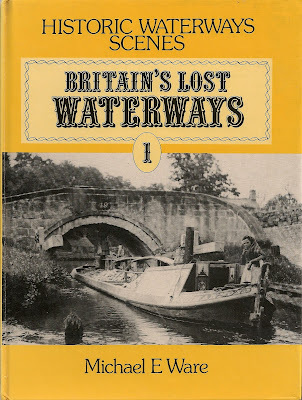 September's edition contains the concluding account of my exploration of Telford's Tub Boat Canals. Having re read it, they seem to have done a good job of editing because it sounds like me - and any historical errors and entirely my own! To save you rifling through the magazine, its on page 74 under "Explore". 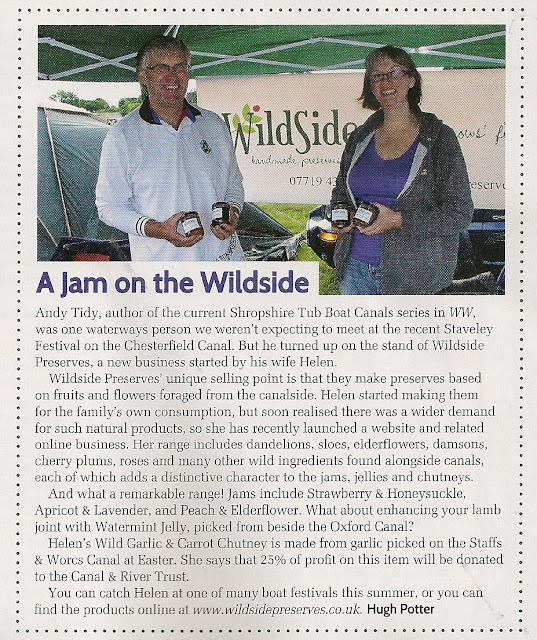 Wildside Preserves website can be found here. And finally, if that's not enough, I was taking a look at the news pages and lo and behold a familiar image already posted on this blog of massed boats (well, three) at Staveley Basin. 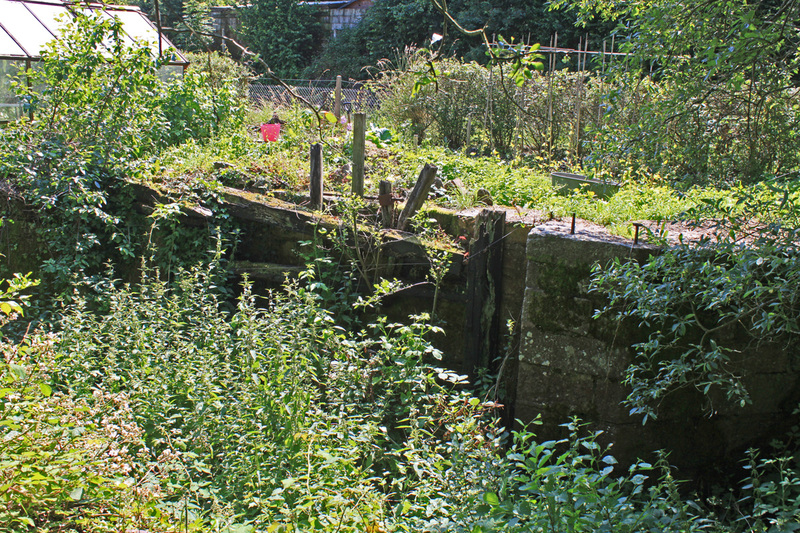 The Canal Society did ask if they could use it, but I didn't realise it would feature in WW. Dont get me wrong, I am fine with it and it was nice to be credited. 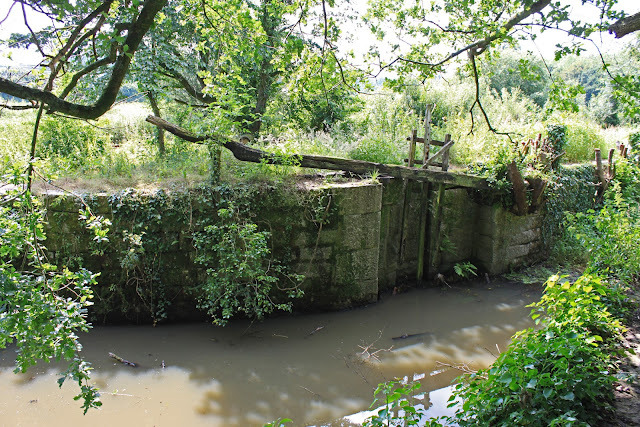 Midway along its path the Stover Canal reveals possibly its greatest treasure, the Graving Lock / Dock. At the time of its construction it was a standard lock, a twin to Teigngrace half a mile upstream. 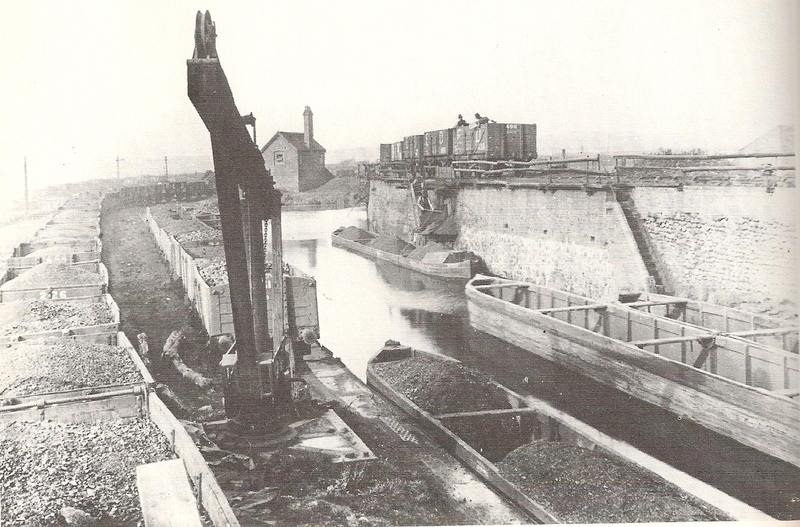 But the arrival of the railway changed things, it was built over the old boat yard which was used to repair the craft, so an alternative was needed. 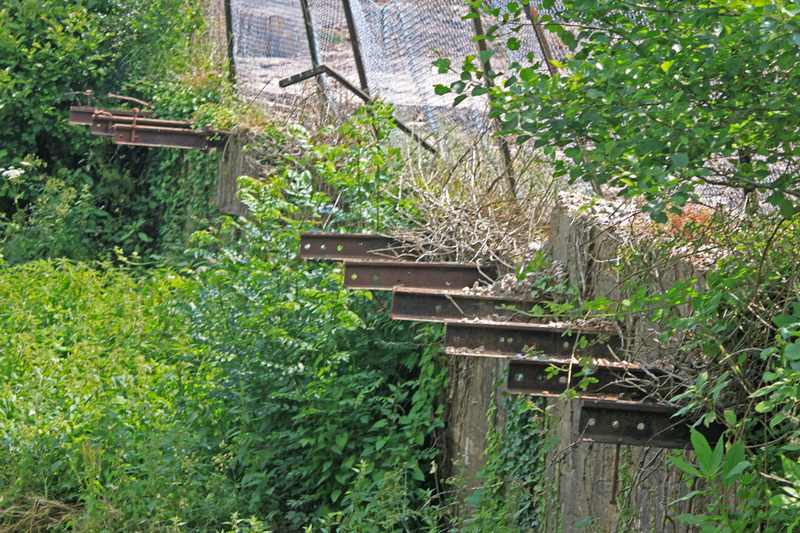 Rather than build a new dock the canal owners took a more expedient approach. 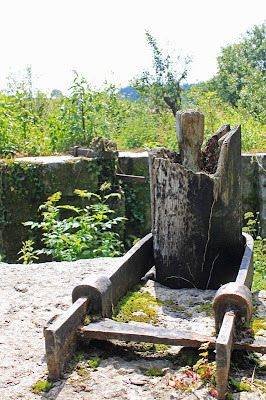 They cut a shelf into the side of the lock onto which a boat was floated and then when the lock was emptied it was left high and dry, ready for repair an caulking. Not a bad idea except it means the lock cant be used whilst it has become a repair yard. AThis approach is unusual but not unique. 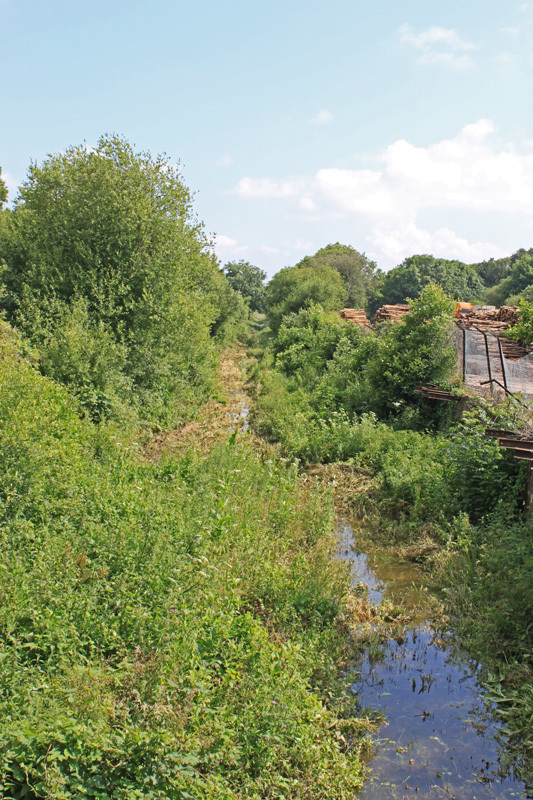 In the second lock of the Hatherton Canal has the same treatment when the rest of the canal was abandoned and the resulting dry dock continues to be used on a regular basis. 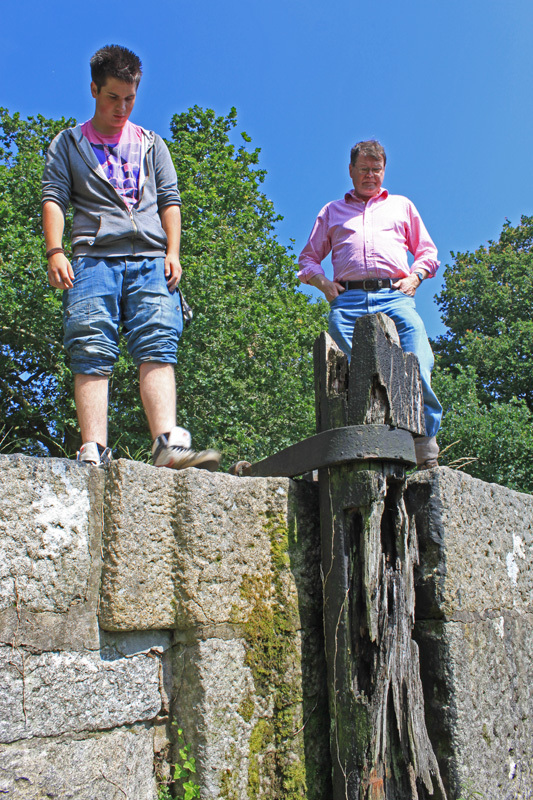 An added snag is that the enlarged lock will use far more water, a real problem for a canal with water supply issues. However, this limitation wasn't really a problem because by the time the railway was built the top section of the canal above the clay cellars was effectively disused. In fact by the time it was converted to a dock the only traffic using it was bound for the repair facility. The lock itself is full of interest. 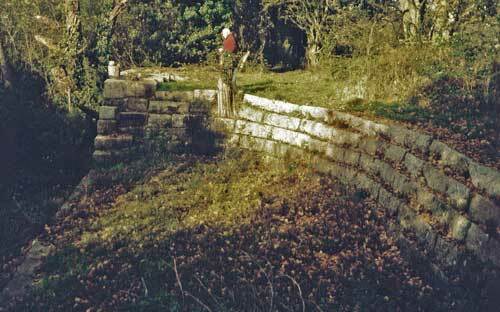 The bed of the graving platform is cobbled and the wall is granite. Most blocks are recycled from the old lock wall, but the extras are rougher chunks of granite, functional but not as well dressed. Then there is the brick crane base, used to help repair the craft. 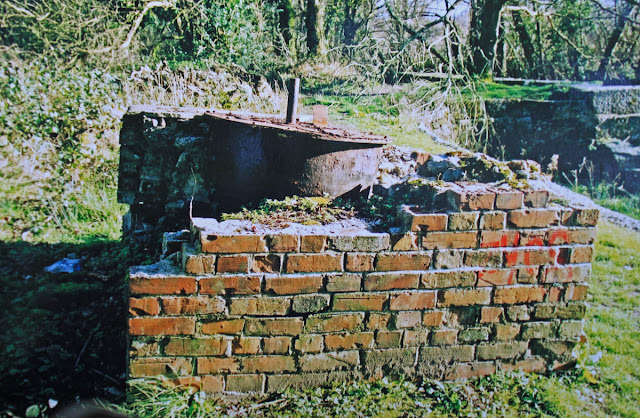 It used to have its metal top in place, but some vandals rolled it into the canal where it remains to date, safe from any other destructive acts. 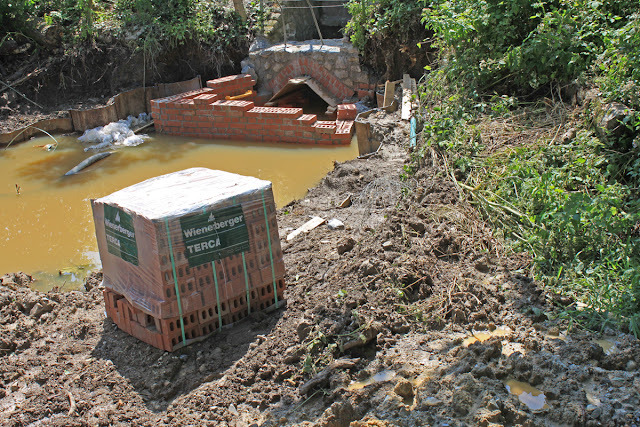 This underwater storage system is nothing new, we do the same with engineering bricks on the BCN, caches stored well away from light fingered builders. Then the are the lock gates. One of the lock gates is remarkably well preserved, its balance beam sits in place constructed out of a single tree branch, with its unshaped thin end still standing proud and waiting for a boater who will never arrive. 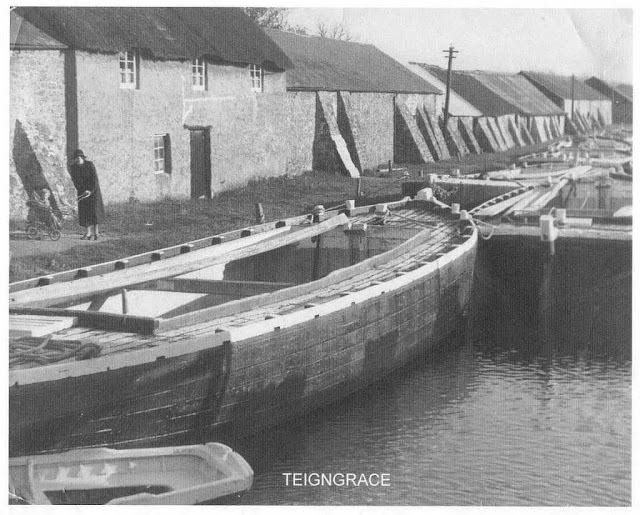 Teigngrace is the top lock of the Stover Canal, and the best preserved. It immediately reveals the wide dimensions of the canal, and is much longer than expected. Long enough in fact to accommodate two of the local craft end to end, but these long and wide locks must have placed a strain on the water supply. At a guess it is well over 80ft long and about 15ft wide. 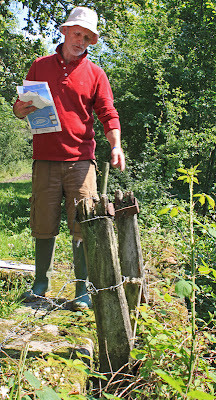 With the water drained out its hard to work out the fall, but 6ft seems about right. Mind you, even at its peak in the mid 1800's the canal was only carrying 1000 craft, which is three a day probably involved just a couple of lock movements on a typical day. Even now the restorers are casing covetous eyes on the water flowing down the beck at the head of the canal, and the line of an old feeder from the nearby River Teign which was filled with the aid of a weir destroyed in the war. As elsewhere, the EA are not keen on extraction for fear of "upsetting the ecological balance". 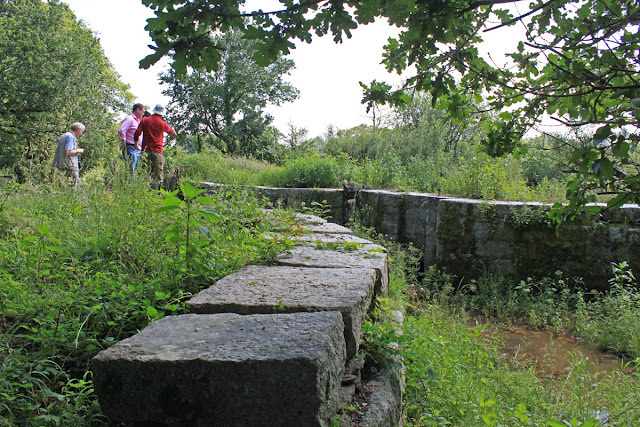 As for the lock, it is predictably made of granite blocks, which have stood firm and intact during its 80 years of abandonment. 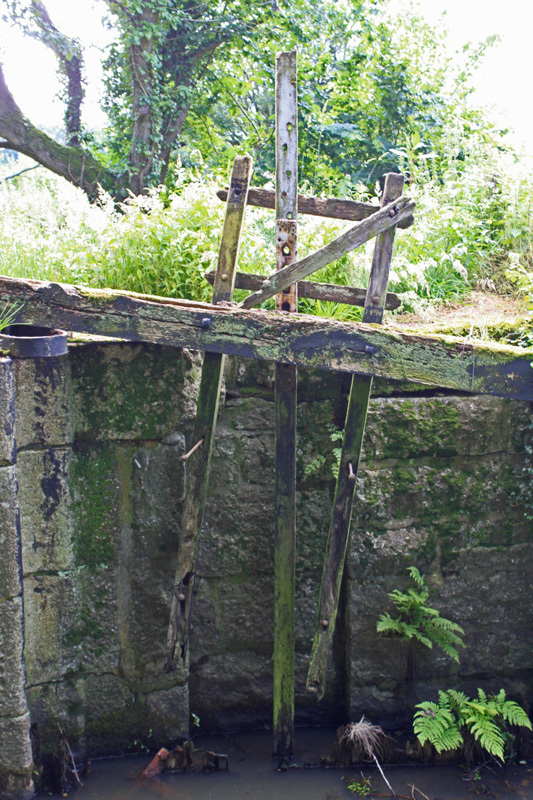 Perhaps even more impressive are the remains of the old wooden gates which remain in place, but are now deteriorating with each passing year. You have to refer to the library shots from a few years back to get a really strong impression of how this structure used to look. Today the offside has been sold off, right up to the lock edge which makes access very difficult. Its also hard to see how the balance beam could ever be operated in the future, unless the owner allows them to build a semi circular path round the back of his compost heap. Paul Taper explains the paddle gear. Paul Taper, the Society Chair provided an excellent guided tour, explaining how the rudimentary paddle gear operated and kindly allowed me to photograph his photographs of the lock when it was last cleared of vegetation. 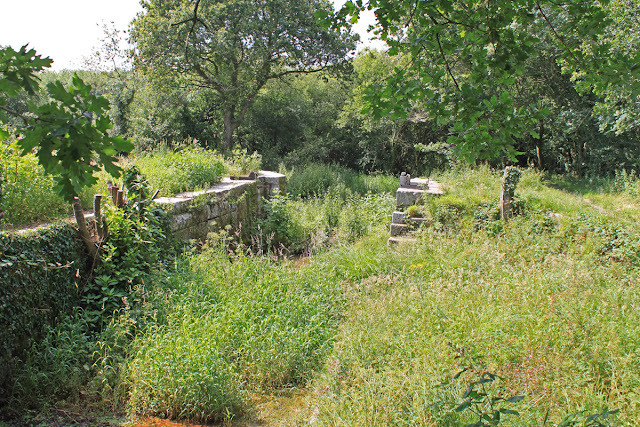 Bridge at the bottom of Teigngrace Lock, Stover Canal. In contrast to my usual practice I am starting this record at the top of the canal, reflecting the route I walked. Maybe the place to start is at Haytor Down, site of the granite quarry which supplied much of the canal's cargo. 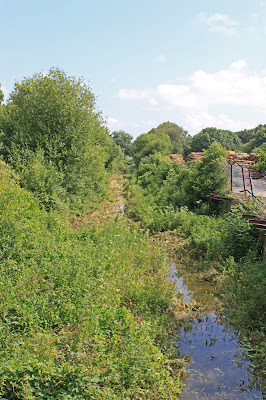 But time didn't permit a walk up the hill so we settled for a good look at the bubbling feeder stream, the remains of the weir and the stopped up sluice. 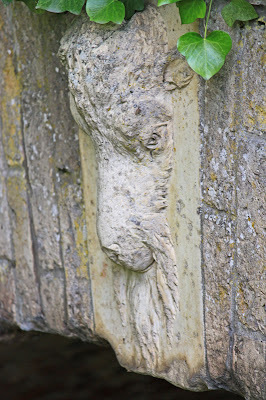 In the above picture you can see a stone block sticking out from the left bank. 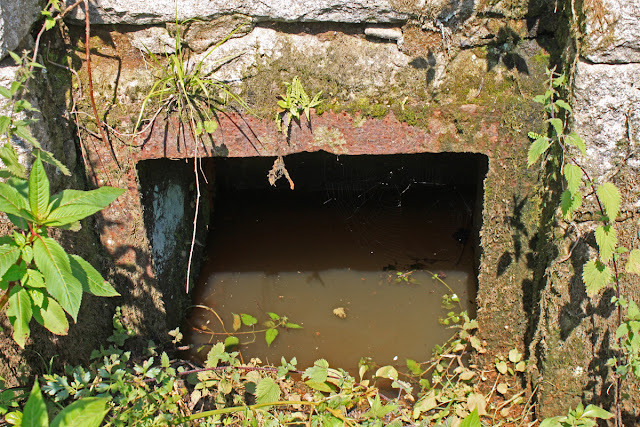 This was an indicator to the canal operators to open all the lock paddles in times of flood. Only the day before our visit the area had flooded and the nearby river overtopped its banks, the water finding its way back into the canal channel and, for a few brief hours, putting the canal back into water. 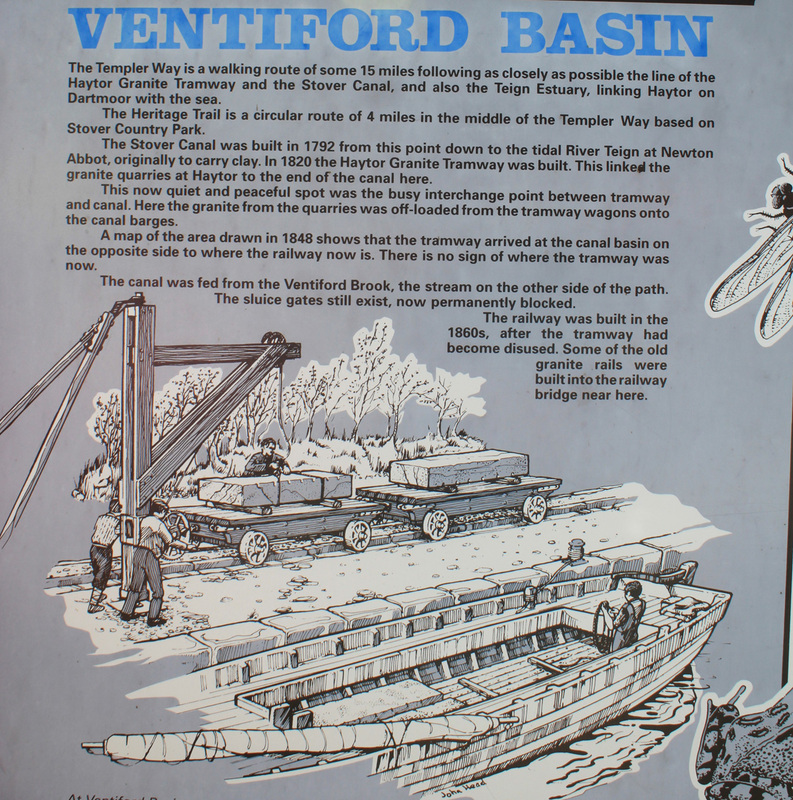 What Ventiford Basin used to look like. 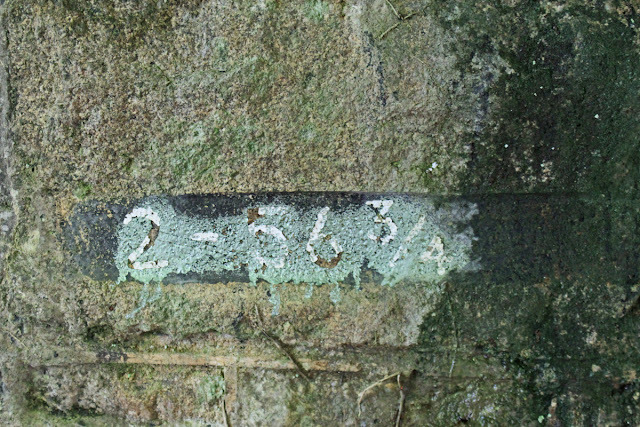 Interestingly, some of the old granite rails have been built into the later railway bridge, but you have to have them pointed out to realise what they are (see photo above). 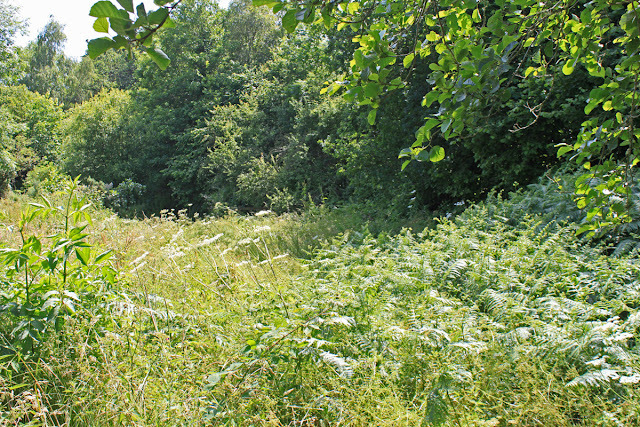 The site of the basin sits beside the later railway embankment, but it is all overgrown and summer probably isn't the best time to visit. There will be a clearer view in the winter when the undergrowth has died down and the channel becomes more visible. 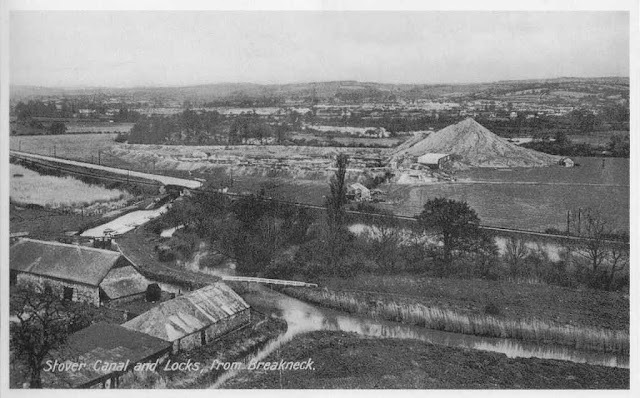 Its hard to imagine all the hustle and bustle of the place, granite deliveries by horse draw tram and heavy loads of clay lining the canal awaiting shipment. These days all that remains is a thick layer of grey clay underfoot, clay which sticks to your boots like great heavy platform soles. A quick look at Google Earth shows the extent of the adjacent clay workings - huge water filled pits and they are still quarrying the stuff 250 years later! There are a selection of interpretation boards to instruct and inform visitors, and then a decent towpath which leads to some on going engineering work to replace a collapsed culvert with three plastic tubes. This work will reduce the flooding risk, but as the culvert was a syphon the introduction of the tubes at canal bed level reduces the potential water depth and throws up a significant obstacle to the re watering of the top end.